This page contains a translation into English of the lyrics to the popular Greek laiko song "Sti Mayemeni Arapia" (Στη μαγεμένη Αραπιά), which was originally sung by Dimitris Roumeliotis and Nota Papanikolaou, then later recorded by Glykeria. Also included is a pronunciation guide for the Greek lyrics so you can sing along if you like. Dimitris Roumeliotis and Nota Papanikolaou were the original artists for this song, recording it as a duet. These biographical notes about Roumeliotis are based on an interview he did with Kosta Hondrou. Roumeliotis was a great rebetiko singer who recorded over 100 songs. Unfortunately, he never achieved the level of fame and commerical success as other popular artists. Nevertheless, he was still highly respected and honored as a great artist in the genre. Roumeliotis' parents were both from Asia Minor (the land mass where modern-day Turkey resides). They fled to Greece during the genocide of the early 20th century. In order for Roumeliotis' father to make it out alive, he needed to dress as a woman to disguise himself. Roumeliotis was born in Thessaloniki, Greece. Roumeliotis began his professional career at age 17, playing at a venue in Thessaloniki. During the German occupation of Greece, the nightclubs were required to close at 10:00 p.m. due to curfew. One night, as he and a friend were walking home, they were stopped by some German Gestapo agents. He was holding his bouzouki, and his fingers accidentally moved on the strings, making the sound "gling gling". When the Germans heard this, they yelled “Mousik, Mousik” and let the musicians go. After the end of World War II, when the Greek record companies began production again, Roumeliotis began releasing albums. Some of his compositions were recorded by other singers. 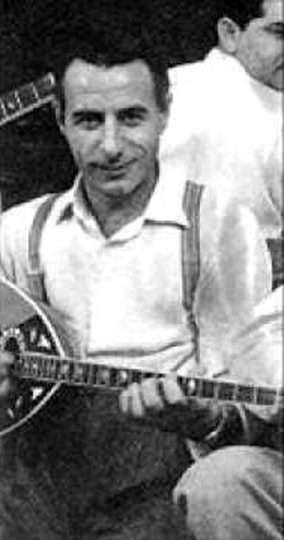 After 1951, he recorded a number of songs by Giorgos Mitsakis, including the one in this translation. In 1968, he moved to Canada. Initially, he planned to stay for only a short time, but one opportunity led to another and he continued to extend his stay. Eventually he brought his wife and daughter to Canada to make their home there. He died at the age of 91 in Montreal. Although Glykeria was not the original artist to record this song, her version of it has been very popular. Glykeria Kotsoula is the sweetheart of Greece and one of the greatest legends of our time. She was born in 1953 in Serres, Greece. Her musical style is modern laika (rebetika & folk), while still always paying tribute to the great Rebetes of the past. Glykeria's music always has and always will inspire me both on and off the stage. I admire her simplicity and humility despite her fame and success. While most kids were learning standard lullabies, my mother would sing all her songs to me, since I was a baby. My mother Evangelia is a huge fan and loves singing her songs. On family road trips, my mother played this song (and all her tapes) over and over again. Those cassette tapes (with this song) are what made me fall in love with Laika/Rebetika style music at the age of ten. Thank you Glykeria, thank you Mama! Enjoy! Most of Glykeria's records have gone platinum. She has gained fame and respect through out the world. Glykeria collaborates with many notable international musicians, including the Turkish living legend, Omar Farouk Tekbilek. Giorgos Mitsakis was the composer and lyricist for this song. He was born in Constantinople in 1921. His famliy relocated to Greece when he was a young child. His father wanted him to be a fisherman, but in 1937 he left home, eventually making his way to Piraeus. There he became a professional musician. After World War 2, he collaborated with prominent musicians, and soon he had achieved a level of fame. έλα να πάμε μακριά ela na pame makria come, let's go far away. στη μαγεμένη Αραπιά sti magemeni Arapia in enchanted Arabia. The original recording of this song says, "Ohhhhhh." However, some more modern recordings of the song say "Ahhhhhh." Many of the old songs use the word "Arapia" liberally. The lyrics generally use it to refer to Arabic-speaking, Romany, or Indian women. Unfortunately, in the modern Greek language, the term "Arapis" has become an offensive racial slur for people with dark skin. Although this newer definition now exists, it did not mean this when the lyrics were written. When newer generations listen to these older songs today, they realize the lyrics are referring to an innocent use of the word, and can enjoy the music in the way it was intended. A "bouzouki" is a Greek musical instrument which dates back to ancient times. It originated with the Greeks in Asia Minor, the land mass known today as Turkey. Greeks lived there in large numbers until the early 20th century. The Greek refugees from Asia Minor brought the bouzouki with them to Greece, and they were the founders of the Greek musical genre known as rebetiko. A "zurna" is a musical instrument from Anatolia that resembles an oboe. It is similar to the Egyptian mizmar. The Greek word "Maharayiades" would be more directly translated to English as "Maharajas." It refers to princes or kings in India.